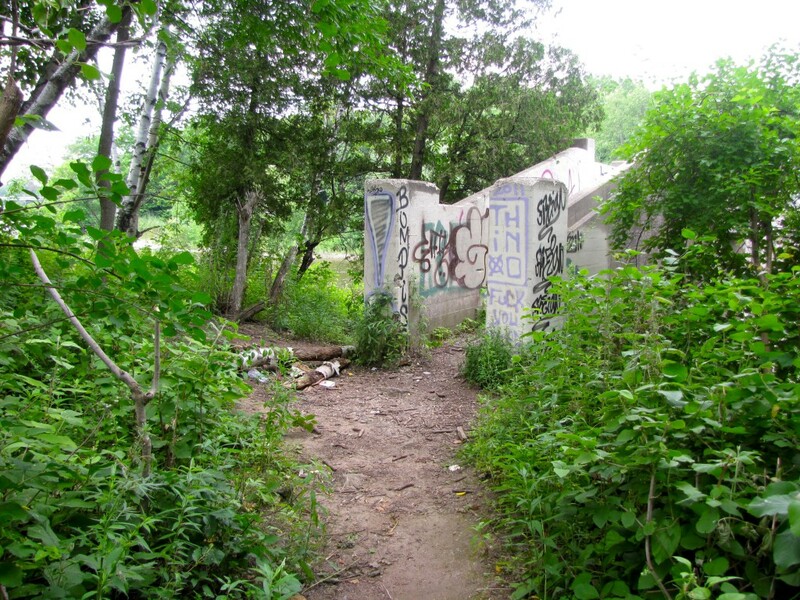 Did Uncle Sam steal part of Estabrook Park? Note: Scroll to the bottom for updated information. No one can explain exactly how it happened, but the Federal government claims to own a piece of Estabrook Park. The property in question is an island in the middle of the Milwaukee River. This tiny island – covered with litter and overgrown with weeds – is significant because Milwaukee County believes island ownership gives the U.S. Bureau of Land Management a say in the long, drawn-out debate over rebuilding or removing the aging Estabrook Park dam. But advocates of rebuilding the present dam across the Milwaukee River say there is simply no record of Federal ownership. On the contrary, it appears Milwaukee County owns this property outright, and has done so for nearly 100 years. To support its ownership claim, the Federal government has festooned the island with Bureau of Land Management signs, included the island on its online map of BLM properties, and … well that’s about it really. The BLM responded to requests to supply proof of ownership by saying its claim is based on its own 1995 survey of the island and adding it would review the matter. The island dispute is confusing, but Steven Bussian, a 30-year mapping industry professional and an advocate for repairing the dam, says the history of land ownership is quite straightforward. Steven’s research, along with work by fellow members of the pro-dam advocacy group Milwaukee River Preservation Association (MRPA), traces ownership records all the way back to the days when limestone was quarried from the Milwaukee River between Capitol Drive and Port Washington Road and the land on both sides of the river belonged to the Milwaukee Cement Co. When quarry operations stopped, about the turn of the 20th century, the company began selling off its land holdings. Between 1916 and 1920, Milwaukee County purchased four Milwaukee Cement Co. parcels comprising all the land on the east side of the river between Capitol Drive and Port Washington Road – today’s Estabrook Park. In the mid-1930s, the Civilian Conservation Corps, a federally funded jobs program, removed a natural limestone “reef” in the river suspected of causing periodic flooding west of Port Washington Road. However, the removal also eliminated a natural upstream water impoundment attractive for recreational use. 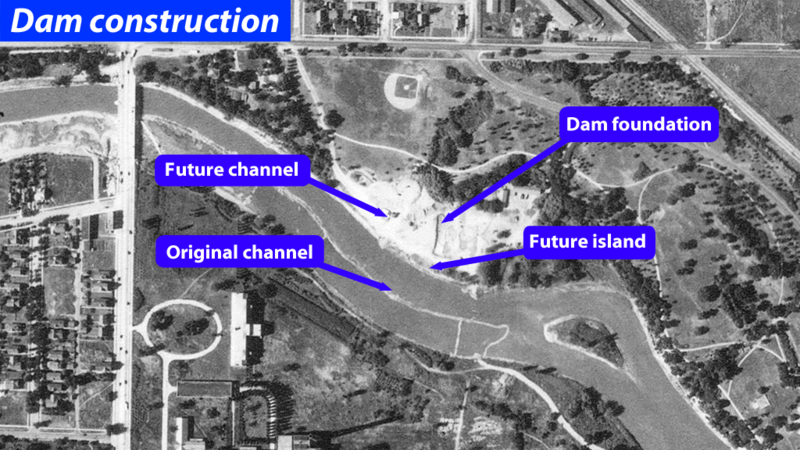 So, as part of the overall project, the CCC built the Estabrook Park dam to preserve the impoundment while controlling flooding. When the dam was in normal operation it maintained a 103-acre pool extending 2½ miles upstream to Silver Spring Road. But how do you build something as complicated as a gated spillway dam in the middle of a river? The short answer is you don’t. Instead, you build the dam on dry ground next to the river and dig a new channel. This the CCC did. When done with that side of the dam, workers temporarily diverted the river through the new channel while they built the distinctive “serpentine spillway” across the original riverbed. However, in between the two sections of dam and now surrounded by river, was a little piece of the original eastern bank of the Milwaukee River. A man-made island very definitely once owned by Milwaukee County, and subsequently, and inexplicably, claimed by the Federal government. Federal ownership of islands is not uncommon. In fact, the BLM owns or manages about 500 islands in Wisconsin most of them omitted from original land surveys in the 1830s and 1840s. Federal ownership is often desirable, as the BLM maintains these islands for the public good. The bureau says its claim is based on a 1995 BLM survey, which determined the island met criteria to be listed as federal property. In reality, all evidence indicates the island wasn’t in original surveys because it wasn’t an island but part of the east bank of the river and, consequently, a piece of Estabrook Park. On Sept. 17, 2014, the MRPA’s attorney, Thomas Gehl, formally asked the Bureau of Land Management to relinquish its claim to the island. On Oct. 22, the bureau responded to the request saying the 1995 survey determined, “based upon certain defined criteria, that the island was indeed owned by the Federal government.” However, the letter continued, the local office of the BLM had asked its chief surveyor to review ownership of the island. Although the MRPA is mostly interested in the dam island, there is also a natural island in the river, just a little downstream. The BLM map calls it “Last Island” (because it’s the last island before the Milwaukee River reaches Lake Michigan). 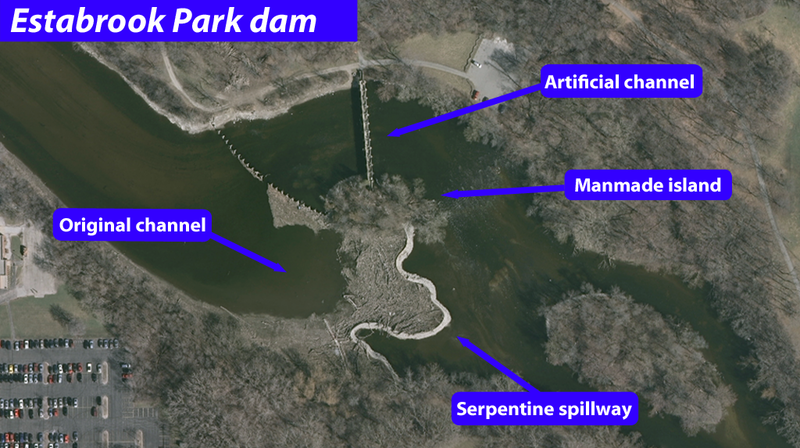 It, too, is claimed as Federal property but in fact Last Island shares the same unique tax key and survey description as the dam island and Estabrook Park itself. It will be interesting to see the Federal response. Will it keep the islands or hand them over to Milwaukee County ownership? 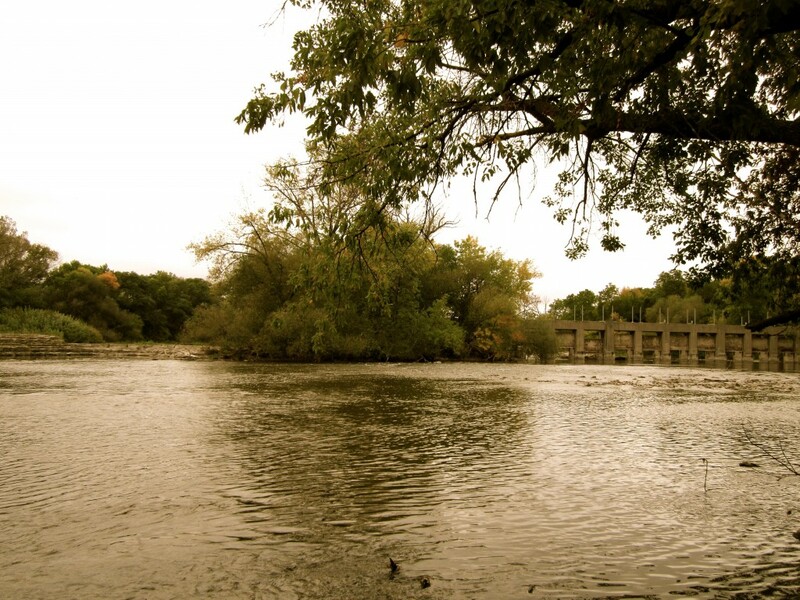 Updated November 2014: The Bureau of Land Management conducted an in-depth study of land surveys going back to 1835 and concluded Last Island, a natural feature of the river, is within Federal domain while Dam Island lies outside Federal domain and is Milwaukee County property. Thanks for another fascinating post! I cannot for the life of me figure out how anyone thought removing a natural limestone reef and re-routing the river through a man-made dam and over an artificial spillway solved any flooding issue whatsoever…And who really owns the island that isn’t an island? I guess we’ll eventually find out. Kind of a cliffhanger.